Cougars can be found anywhere in the state, but the highest concentrations are in the Blue Mountains and the southern Cascades. Cougars are territorial, occupy a range of up to 100 miles, and are lone hunters. Their tracks are large roundish paw prints without claw marks. Dog track toes, on the other hand, include holes in the snow or mud made by the claws. Their primary prey is deer, but they will also take ground squirrels, elk, raccoons, bighorn sheep, and other mammals and birds. Sometimes they will come into human habitation areas and kill livestock and pets. Every once in a while a cougar has appeared in Sisters Country, and because it was a potential threat to man and livestock, it was killed by an authorized wildlife official. In most of these cases the cougar had appeared by surprise, and according to wildlife biologists, it may have been following, or looking for a deer. That’s one reason the City of Sisters has the ordinance against feeding deer within the city limits — no sense in inviting cougar into your backyard. Last year, two people — one out biking and the other hiking — were killed by cougar, one cycling in Washington and the first-and-only-in-Oregon, was hiking in the Mt. Hood National Forest. Of the list of 16 people who have been killed by cougar throughout the U.S. since 1970, the majority were children on their own, without adult supervision; others were adults running, hiking or exercising. There is one outstanding fact about cougar that we humans must take into consideration when we’re recreating or active “out in the wild.” Cougar chase down their prey and kill it. If you try to outrun a cougar on foot or on a bicycle, you will almost certainly trigger the chase response in the cougar. ODFW has a list of do’s and don’ts when it comes to cougar contacts. They are listed below in the event you have not been successful in reaching the ODFW website, or missed it. 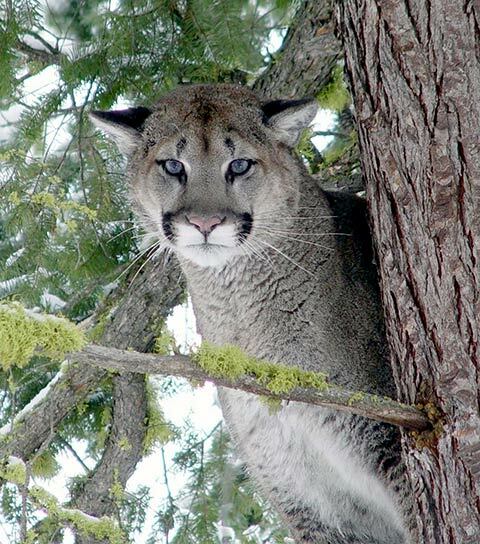 Report any cougar sighting or encounter to a local ODFW office or the Oregon State Police. If you pay strict attention to the guidelines and should come into contact with a cougar in its territory — or wandering around in yours — everything should come out well for all parties. •Learn your neighborhood. Be aware of any wildlife corridors or places where deer or elk concentrate. •Walk pets during the day and keep them on a leash. •Keep pets indoors at dawn and dusk. Shelter them for the night. •Don’t leave food and garbage outside. •Use animal-proof garbage cans if necessary. •Remove heavy brush from near the house and play areas. •Install motion-activated light outdoors along walkways and driveways. •Be more cautious at dawn and dusk when cougars are most active. •Do not feed any wildlife. By attracting other wildlife, you may attract a cougar. •Keep areas around bird feeders clean. •Deer-proof your garden and yard with nets, lights, fencing. •Fence and shelter livestock. Move them to sheds or barns at night. •Be aware of your surroundings at all times. •Leave your dog at home or keep it on a leash. Pets running free may lead a cougar back to you. •Hike in groups. Make noise to alert wildlife of your presence. •Keep children close to you. Teach them about wildlife. •Keep campsites clean. Sleep 100 yards from cooking areas. •Store food in animal-proof containers. •Be cautious at dusk and dawn. •Never feed any wildlife. Prey attracts predators. •Do not approach any wildlife; stay at least 100 yards away. •Steer clear of baby wildlife. Mother is likely nearby. •Be alert when sitting quietly or stopping to rest. •Be especially alert at dawn and dusk when cougars are most active. •Be aware that animal calls and animal kills can attract a cougar. •Cougars often will retreat if given the opportunity. Leave the animal a way to escape. •Stay calm and stand your ground. •Pick up children, but do so without bending down or turning your back on the cougar. •Do not run. Running triggers a chase response in cougars, which could lead to an attack. •Raise your voice and speak firmly. •If the cougar seems aggressive, raise your arms to make yourself look larger and clap your hands. •If in the very unusual event that a cougar attacks you, fight back with rocks, sticks, bear or pepper spray, tools or any items available.